I’m always petrified that something is on my face or in my teeth. Chipped nail polish bothers me to no.end. I really wish I could be a good beer drinker. By “good” I mean, a beer drinker at all. Sadly, anything other than fancy shmancy microbrews gets the stuffy nose from me. I really can’t hang with the cheap beers. Sorry I’m a party pooper. Also, I wish I could be a good wine drinker. Or hell, a good drinker at all. I only order Midori Sours and refuse to order anything else in fear it’ll taste like alcohol. A few weeks ago, Jessie and I went to a place for lunch that’s known for their sangria. I ordered a small “taster” cup and was disappointed that it “tastes too much like wine.” Ugh, on second thought, I just need a juice box. Yesterday, a coworker asked me what kind of music I liked to listen to and what my favorite band was. I was ashamed to admit that truthfully, I’m not a big music fan. Well–lemme rephrase that. I like music, I just only like about 4 songs at a time. “Shuffle” on my iPhone consists of me vetoing EVERY.SINGLE.SONG until I get to the four I like. Seriously. So I just told him I liked the eclectic 80s band Oingo Boingo (they really are my favorite) and called it a day. Did you hear Tom and Katie broke up? I don’t care either, but it bears mentioning I suppose. Maybe now Katie can stop dressing in a style I can only describe as “homeless person chic” and stop eating placenta. Also, maybe now Tom can stop being the creepiest person alive aside from Nicolas Cage, Dennis Quaid and John Travolta. Yeah, they all oog me out like nothing else does (okay, maybe eating your own placenta oogs me out just as much but still). I just bought a chiffon blouse with skulls all over it, a giraffe head ring and leggings with nebulas and galaxies on them. I don’t know when I’m supposed to start buying “adult” clothes that scream “professional” and “sophisticated” but I’m guessing at this rate I’ll forever look like I’m in costume. ^^ it’s like when you see young girls wearing really professional-looking clothes and you’re like, “girl, you’re only eighteen! Why are you wearing slacks and fancy tops and modest-looking, not-even-cute flats? You should be wearing something young and cute.” But I’m sure that girl is probably looking at me and wondering why that chick is wearing a galaxy on her crouch. Touche, girl, touche. I’m having an apparent cookie dough moment lately. Call me crazy but cookie dough is badass. I will stop at nothing to stuff these little egg-free balls of heaven into virtually everything & anything. Mmmmkay, so lemme preface this by saying I was originally not keen on the idea of putting cookie dough into cinnamon rolls. 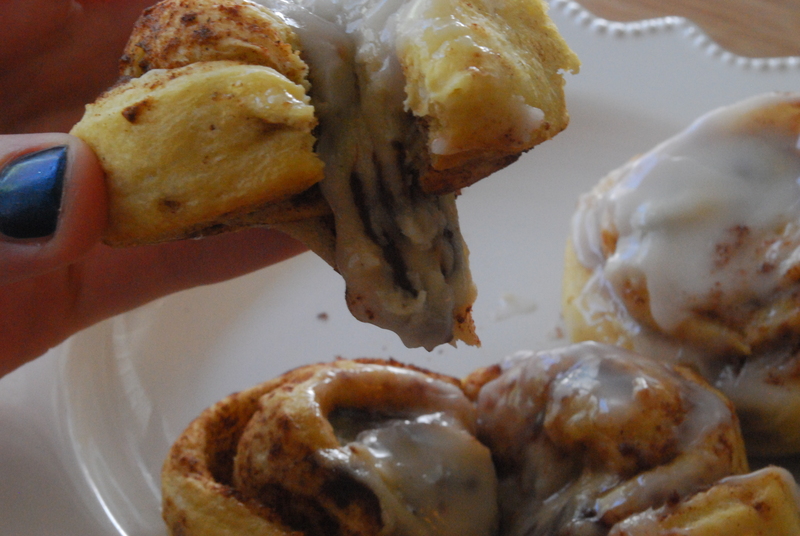 I mean, why mess with a good thing like an ooey gooey cinnamon roll? It’s nearly perfect on its own in its rotund, cinnamon-y glory. Adding cookie dough to it seemed like…overkill. But I decided to give it a whirl and only stuff half of my cinnamon roll batch just in case my prior assumptions were correct. I hesitantly wrapped the cookie dough into each cinnamon roll center, baked them, and pulled them out of the oven all gooey and golden and ready to be eaten. One bite of the Chocolate Chip Cookie Dough Cinnamon Rolls and I was convinced: a good thing can be improved upon, and you should definitely give it a try anyways. The cookie dough isn’t terribly noticeable, actually–rather, it adds an additional gooeiness to the roll and is a fun surprise. Plus chocolate + cinnamon is TO.DIE.FOR so that did it for me. Forrealsies, will you please give this a try? I mean, someone else needs to be as cookie dough crazy-adventurous as me. Just be crazy with me and I promise you don’t need to wear galaxy leggings or anything too insane. 1. Preheat oven to 350 degrees F. Liberally grease a 13×9 inch pan or two 8″ rounds with cooking spray and set aside. 2. On a clean, flat work surface, gently unroll each cinnamon roll. 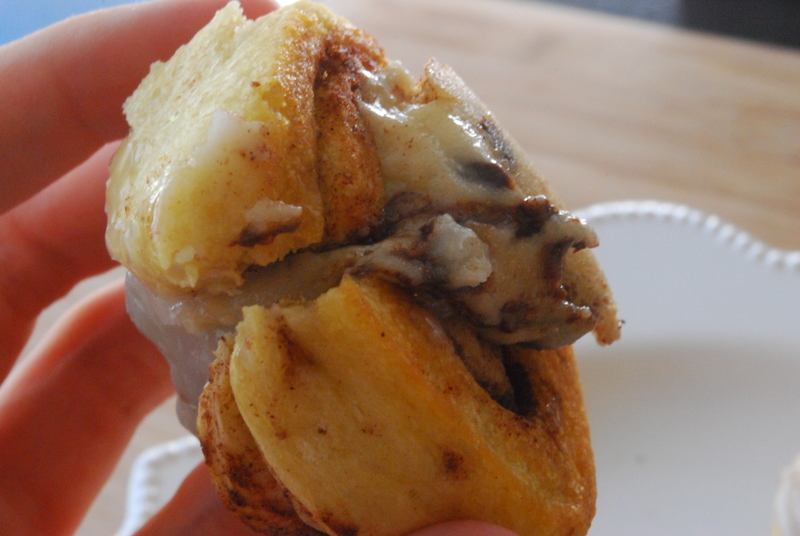 Place one frozen cookie dough ball in the center of each cinnamon roll, then gently re-roll. Place the rolls into the greased baking pan(s) about a half-inch to an inch apart. 3. Bake for approx. 10-15 minutes or until golden brown and set; do not over-bake. Remove from oven and immediately ice with the provided icing. Serve immediately. OMG. Ooey gooey goodness, people. I think these would be equally awesome with peanut butter cookie dough, oatmeal, or even snickerdoodle. Experiment!! I hope you have a relaxing Saturday and a great weekend! This looks easy! 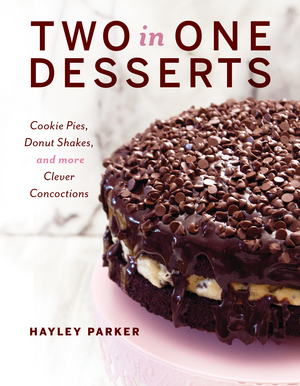 It doesn’t call for my stand mixer or yeast either…………I can do it and Mr. Picky-eater, a fan of cinnamon and chocolate chip cookies should really like it! I know, I really loathe using yeast. I’m scared of it :/ these are super duper easy, Kelli! I so agree on the alcohol. The only thing I will EVER drink is Smirnoff Ice and even that is VERY.RARE. I just don’t like the taste of alcohol, and I can taste it. Because of this *almost never drinking*, when I do drink it takes a ridiculously small amount to get me to, oh, say, walk into walls! Makes for an *interesting* evening for sure! Lol, same here! Unless it’s a Midori Sour or some kind of fancy wheat-y beer, I’m turning my nose up at it. Sigh, why can’t we be cool?! (Just kidding, I actually think we’re cool for not drinking like oafs all the time). I’m not a beer drinker, either. Wine, on the other hand…different story. =) But my affinity for wine didn’t happen until my mid-20’s. Okay, these rolls sound amazing! I love, love, love cinnamon rolls, but let’s face it…who has time to make the yeasty ones all of the time (or ever??). 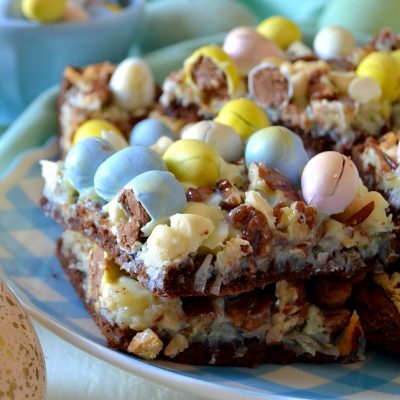 And stuffing these with cookie dough filling? Oh, heck yeah! I really hope I’ll develop a wine affinity but I don’t know, it’s too… bitter for me, I think. I feel like I need to add like, a cup of sugar per cup of wine lol. No, I know exactly what you mean, because I was the same way for a long time. Start with a really sweet white, like a Moscato. It’s great chilled in the summer with a bowl full of strawberries! I am not a beer drinker either, I think its kinda gross. Plus for some reason I think of it as a man drink and it seems weird to see chicks drink it. I don’t know why. I adore cinnamon rolls but they HAVE to be gooey. Therefore these look heavenly! 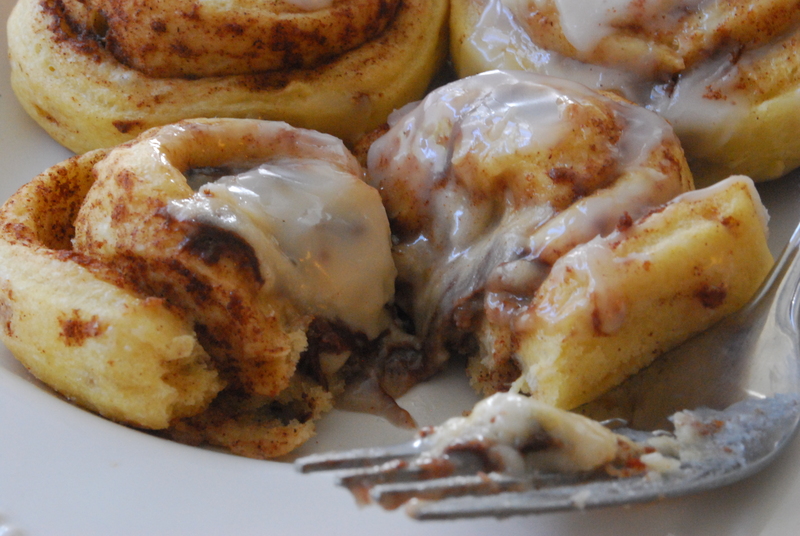 So ooey gooey…if only my husband had these baking away right now. That would be a great start to my day! Yeah, beer drinking DOES seem manly. I always thought it was kinda weird myself when I saw slutty girls at parties pounding back Coors Lights and stuff… I mean, shouldn’t they prefer something girlier? Lol. OMG. These are outrageous. I need them! I do not like beer either, and if I have a mixed drink it HAS to be sweeter and juicier than alcoholic. I want my drunk to come out of nowhere, thanks very much. 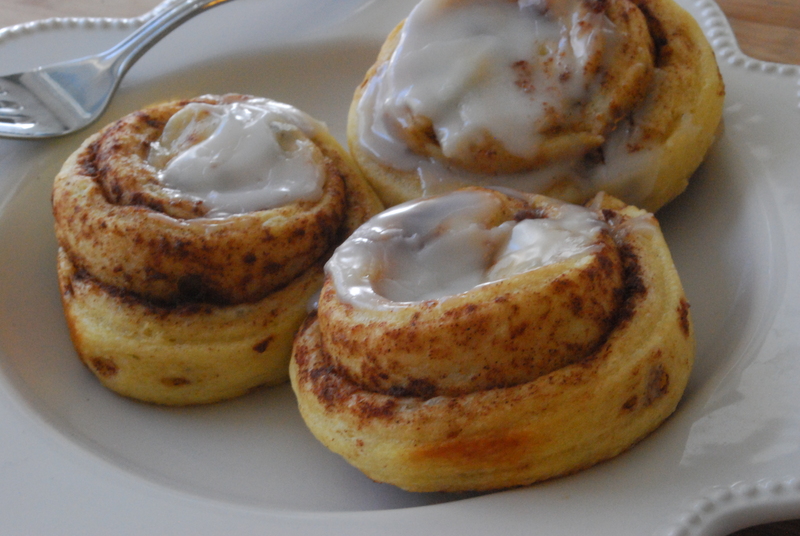 Oh my god these cinnamon rolls look SO good. Let’s eat a plate while we listen to the 16 songs combined on our shuffles. Yes, but my shuffle is more like 5. Ugh, I’m annoying!! And I agree–drunk needs to come out of nowhere. I think when I start knowing the difference between Smirnoff and Grey Goose straight and prefer my drinks on the rocks or “stiff” you know I’ve gone off the deep end! 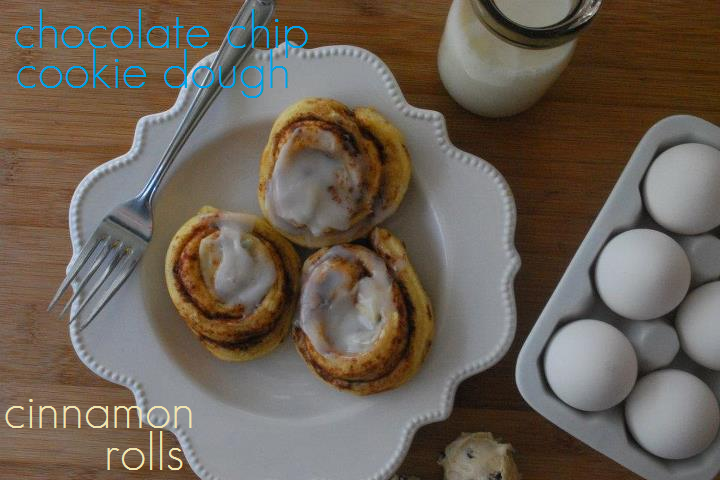 love cookie dough…and cinn rolls. Together? Even better! We were both on a cinnamon roll kick this weekend Hayley!!!!!! LOVE it. We’re twins. And since I made CAKE BATTER cinnyrolls, I gotta make your cookie dough ones real soon! And I love that you used premade cinnamon rolls, too. I’m all about shortcuts! OMG, I know! I’ve totally made the little bitty regular ones before from scratch (seriously just as easy as buying premade ones!) but I had premade on hand and made these before work. They’re awesome, but I really wanna try your cake batter ones! I love that you used the store bought rolls…so much easier and faster to get the goodness to my mouth!!! 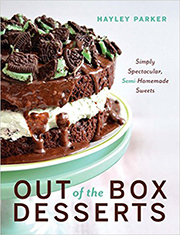 These look uber delicious and ooey gooey!!!! LOVE!! !